Parison met us at the campground gate, walking stick in hand, to guide us out to the lake. 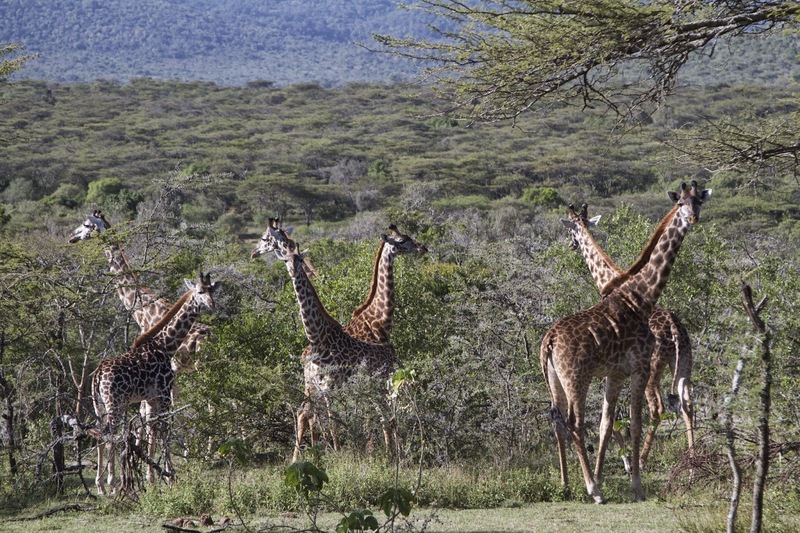 Like most Maasai men he was tall and thin, a shock of bright red robes tied artfully around him. He got in the car with us and we drove down the road, fording the river where women were washing clothes on the rocks, children playing in the water and staring at us as we passed by. 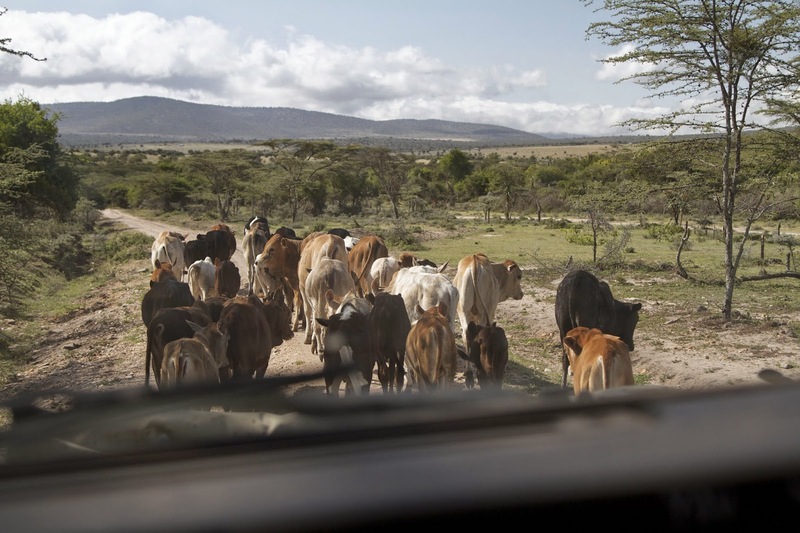 Getting caught behind a herd of cattle that weren't in the least interested in moving off the road, Parison reached over and honked the horn telling Mark to keep driving, they'll move when they see you won't stop. The boys that were supposed to be tending the herd stood alongside the road and watched, laughing as we slowly nudged our way through the cows. Parison and Mark walk ahead along the lake shore. We parked on the edge of the shoreline far enough away to avoid the sticky mud that lurked closer to the water. Parison took the lead and started walking to the lake's edge, his long legs moving so quickly I had to break into a trot to keep up. The salty crust under our feet made crackling noises as we broke through to the silty mud below. It started to get a bit slippery, forcing us to take smaller steps so we wouldn't slide into an unplanned split. 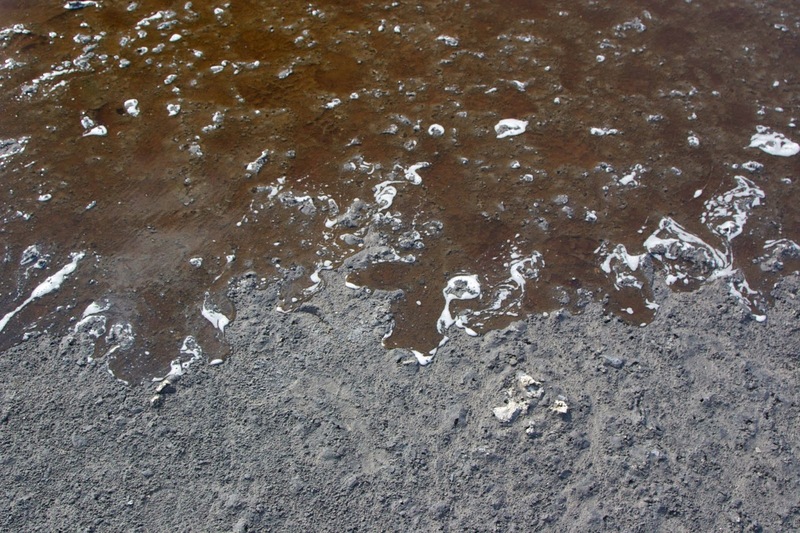 Footprints make trails across the muddy lakeshore. 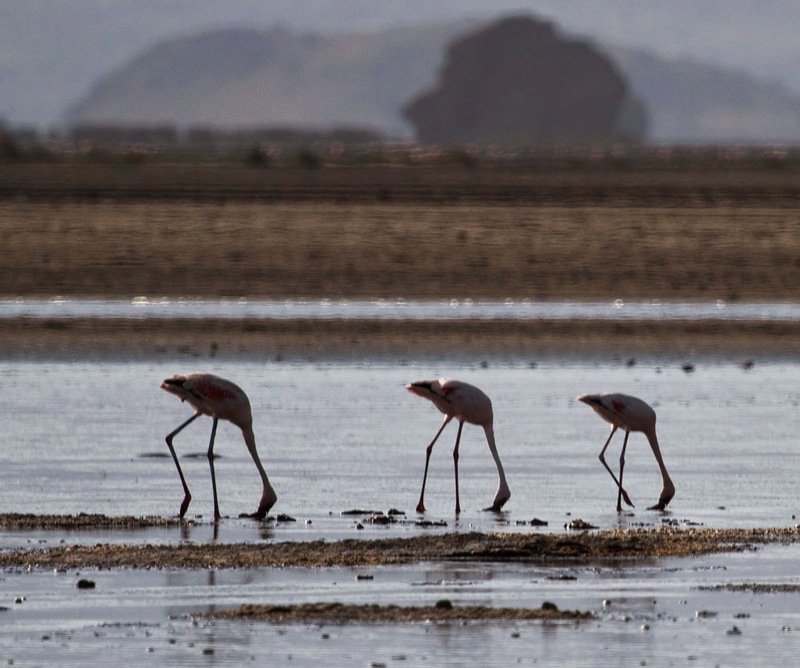 the main diet of the Lesser Flamingo. 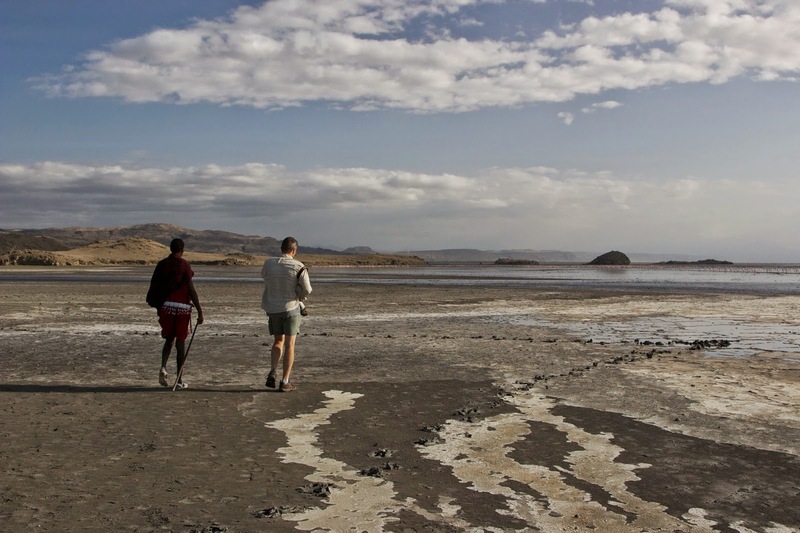 Lake Natron is a huge alkaline lake. It's situated in a wide desert valley ringed by rocky mountains. The lake has no natural outlet so what little water runs in has only evaporation to take it away. This concentrates the sodium and potassium carbonates (that leach from the ash spewed by the nearby active volcano) into a lethal stew capable of burning human skin. 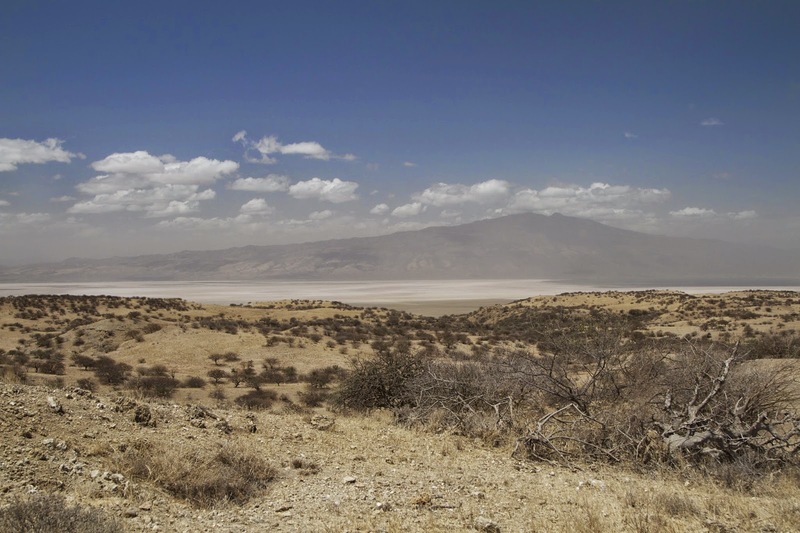 The lake is also shallow—3 meters at its deepest—and in the hot desert sun it reaches temperatures of up to 140 degrees fahrenheit. 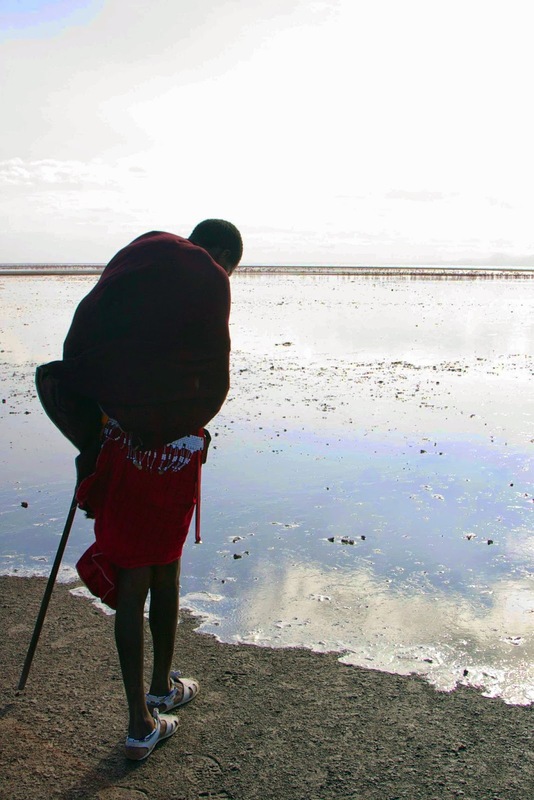 The water doesn't support much life but for one important exception; the red algae Spirulina, the main food source for the Lesser Flamingos that flock there by the thousands. 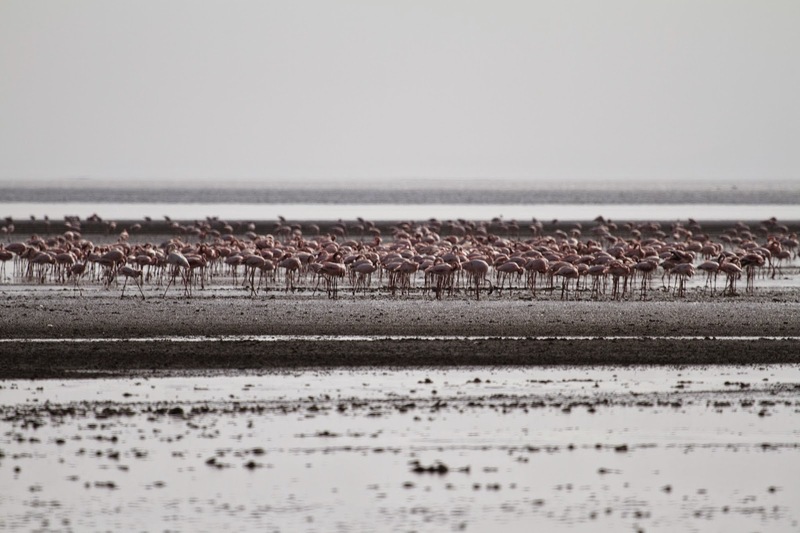 Lesser Flamingos hunker down in the strong wind at Lake Natron. We had come to see flamingos and the lake didn't disappoint. Hundreds of birds stood ankle deep in the water, dipping their bills in and out as they scooped up algae. The wind was screaming across the valley making it hard to keep the camera steady enough to get a good shot. We stood squinting into the wind trying to take it all in, tears streaming down our faces from the salty dust that blew into our eyes. modestly trying to hold his robes in place in the wind. We climbed onto a rocky outcropping that jutted up from the lake bed. As far as our leaking eyes could see a fuzzy carpet of wind-blown flamingos were spread out across a sheet of rippling water. On the other side of the outcropping was a large marshy area covered with bright green grass. It was a jarring sight, set against the rest of the horizon of dull gray rocks. 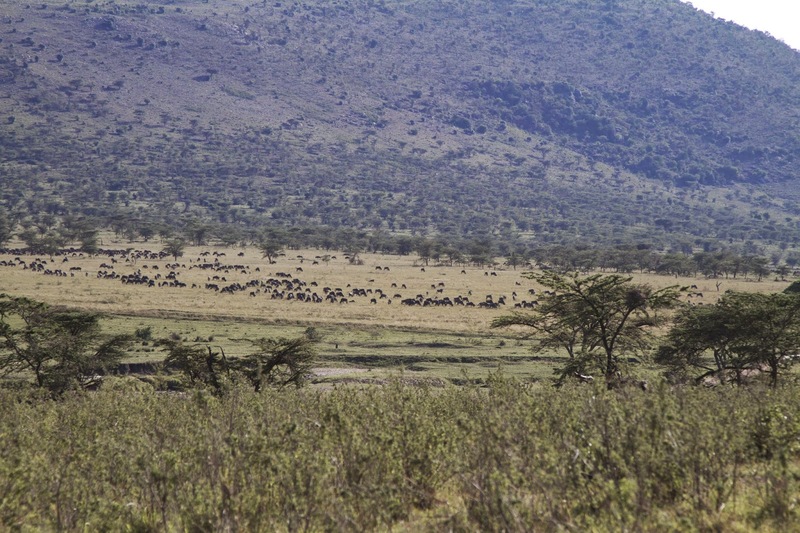 Parison explained that a small freshwater spring fed this area, and to prove that fact there were a few zebra grazing on the grass below. There was also a fresh zebra corpse, it's stomach torn open and most of its innards missing. 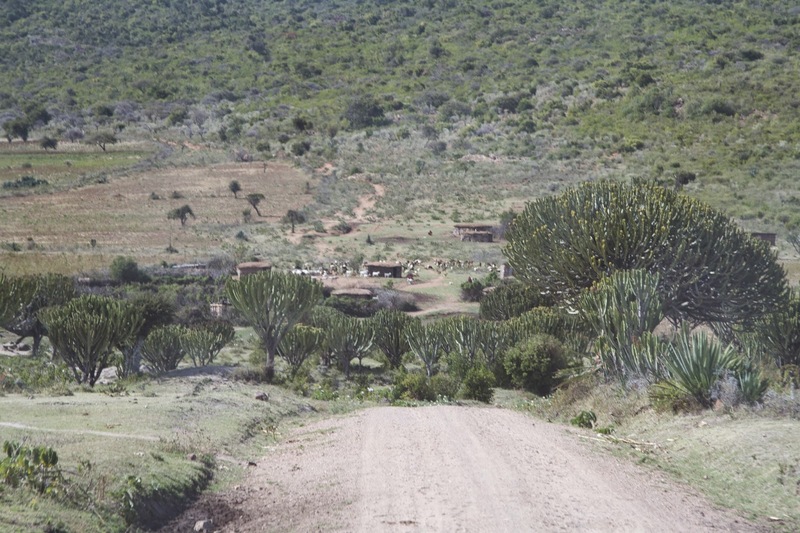 Parison told us there weren't any lions in the area, but there was a band of roving hyenas that made life hell for the Maasai herds and the few zebra that made a home here. Good to know. 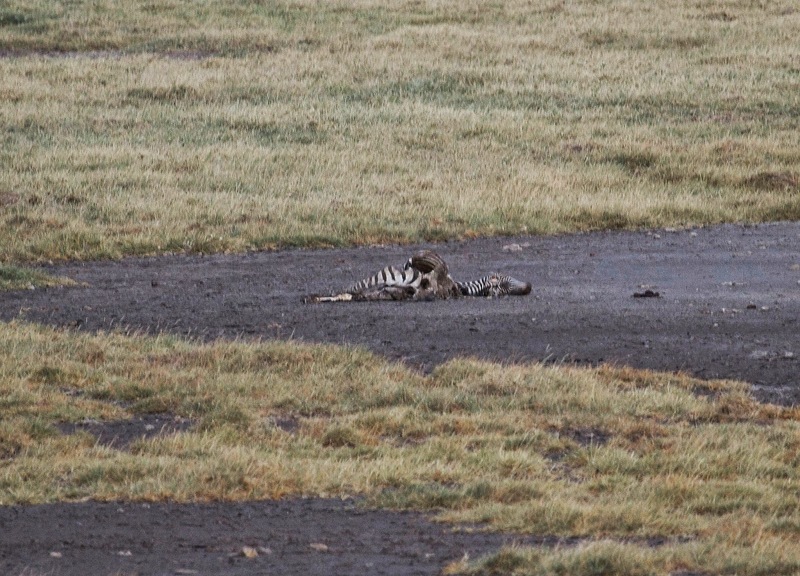 What was left of a hyena dinner: Zebra carcass on the marshy plain. We stayed on the rocks taking pictures while Parison made himself comfortable on a big boulder. He was an experienced local guide, not impressed by the scenery he had grown up with. When the wind became too much for us we walked back toward the car, Parison curiously slowing his gait as we got closer to the vehicle. Out of the bushes a line of women emerged and made their way toward our vehicle from the direction of the village. We arrived at the car at the same time they did and were immediately mobbed by enthusiastic saleswomen shoving bracelets, earrings and carvings into our hands. 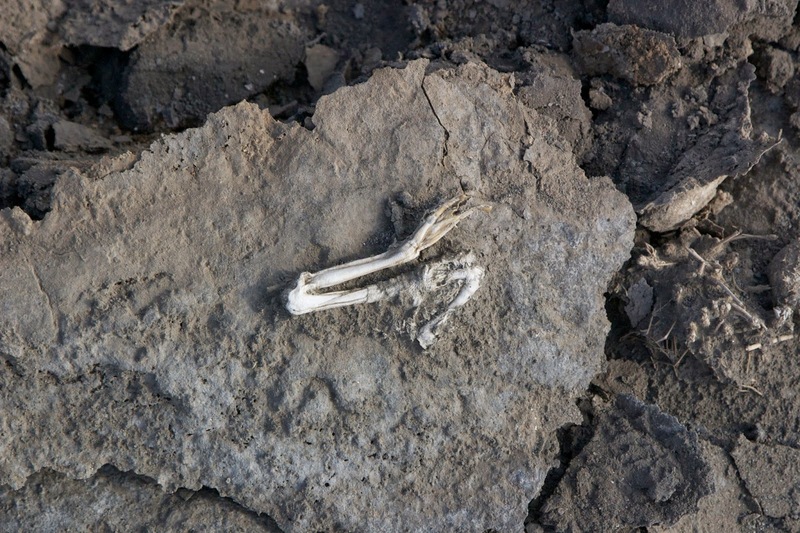 An unlucky flamingo's leg is perfectly preserved on the salty crust of the lakeshore. 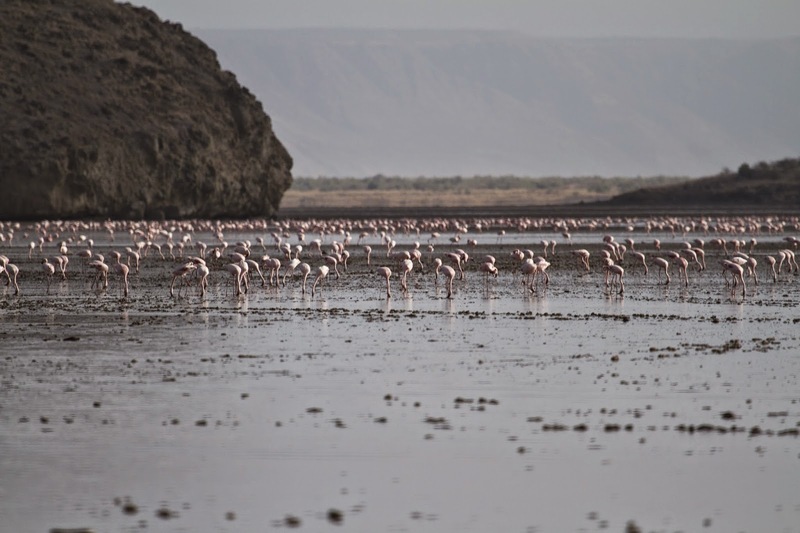 It's a hard life in the Lake Natron area. 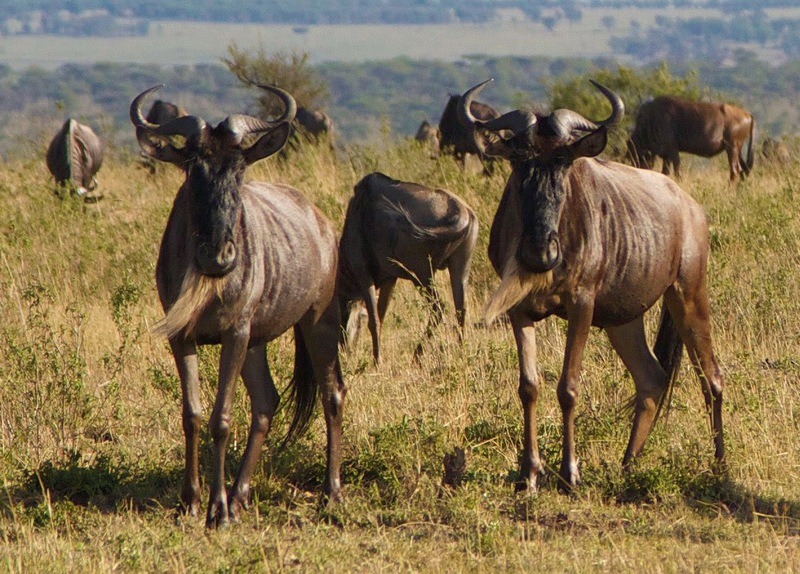 There's not much for the Maasai herds to eat, water is scarce and big game doesn't really come into the area much so tourists are few and far between. The locals make their money as guides or by selling handmade jewelry and they work hard for what little they earn. We had already purchased so many bracelets and necklaces at previous stops we had run out of people at home to give them to; besides we had to save what cash we had for diesel and tolls on the road out of here. The women were all friendly and nice, but insistent. I got the brunt of the sales pitch as the ladies snapped bracelets on my wrists and held earrings up to my head "Pretty? Yes? You buy?" Mark and Parison stood off to the side and watched, amused by my struggle to say no politely. An elder woman had taken a shine to Mark though and offered him a ring, free of charge. It turned out this was Elizabeth, one of Parison's mothers*. Most of the other women were his sisters and cousins. 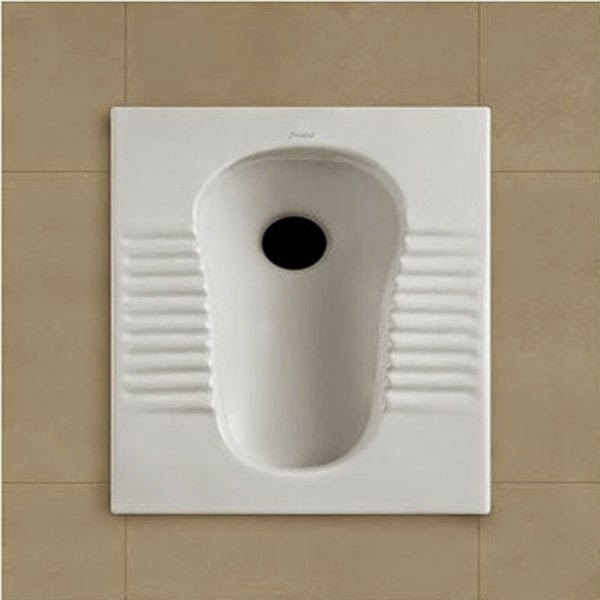 Ah, now it made sense. 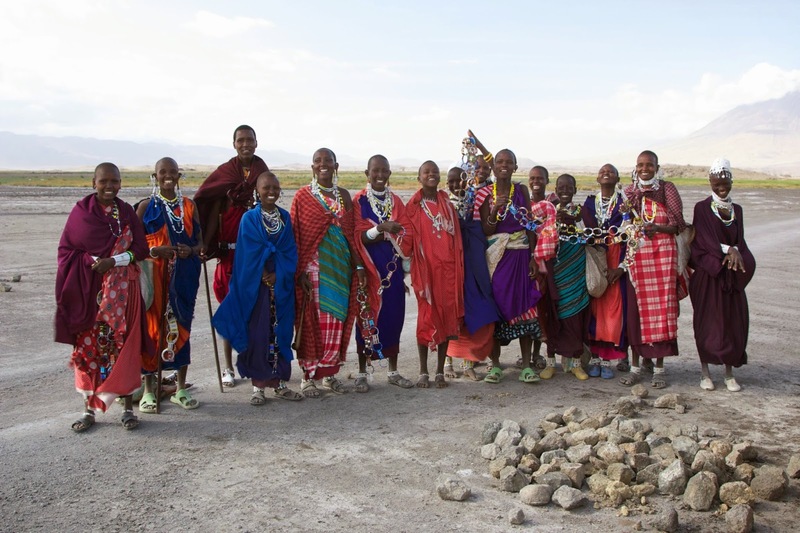 *Maasai men take on as many wives as they can support. Elizabeth was one of eleven women that raised Parison and his siblings. Elizabeth worked on Mark to buy something for "Mama" (me) while I was losing the battle against the rest. Finally one of the younger women got tired of hearing no and said "OK, no bracelet? Then picture! You pay for picture!" An out! I had an out! "OK, I will give you 10,000 shillings for a picture. But it has to be all of you. And you have to look pretty for the photo." 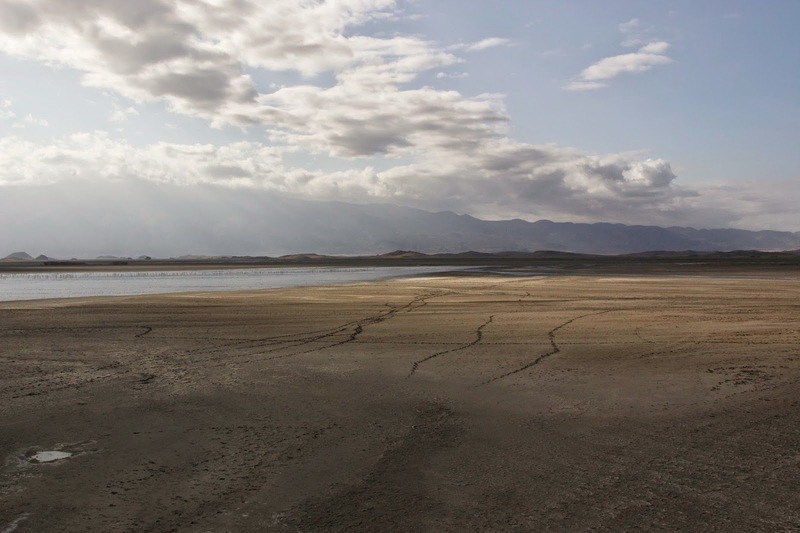 They all laughed and lined up enthusiastically on the dry lakebed. I took a few shots and they ran over to see them on the camera (digital cameras are a godsend; it's so wonderful to be able to immediately share a photo with your subjects, especially in places where cameras are few and far between.) I have never been so happy to pay for a picture in my life. 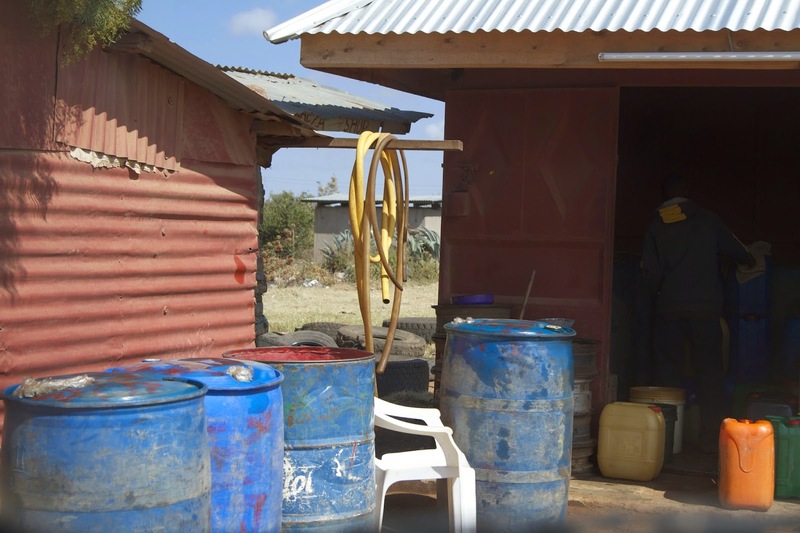 We got into the car at last, and the women made their way back to the village, apparently satisfied with our transaction. This picture, by the way, is one of my favorites out of the hundreds we took on the trip. Totally worth the 10,000 shilling ($7.00) price. The group photo: Our guide Parison (the tallest and only male), his mom Elizabeth (just to the left of him) and the rest of the clan. The women are holding up strings of bracelets, rings and necklaces they were selling.